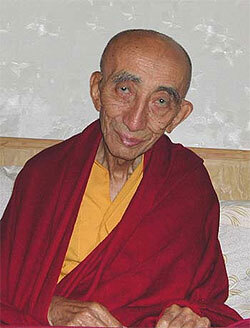 He lived one of the more interesting lives of a Buddhist lama. Born into a royal family of Ladakh, India, he was later recognized by the Thirteenth Dalai Lama as a reincarnation of Bakula Arhat – one of the Sixteen Arhats (direct disciples of Shakyamuni Buddha who had tremendous spiritual realizations). After Rinpoche worked as a minister of the Indian government under Indira Gandhi, he began to travel to Mongolia and the USSR, where he helped re-open ancient monasteries and organize Buddhist peace conferences. In 1990, was appointed as the Indian ambassador to Mongolia for a period of two years. When he arrived, Mongolia was still communist, but during his stay – which lasted more than 10 years – it became a free country, so Bakula Rinpoche could travel freely and work to revive pure Buddhism. Interestingly enough, according to Mongolian folklore, there was a long-held belief that Bakula Arhat would one day come from India to revive Buddhism in Mongolia. Perhaps it wasn’t folklore. On the 26th February 2008, His Holiness the Dalai Lama has confirmed Thupten Ngawang, a child born in Nubra, Ladakh as the reincarnation of Bakula Rinpoche. The child is a bright little boy born on 24th November 2005 and has been chosen from among several children.